State Government General Secretary Dinesh Kumar made it clear that how much the industries needed to the state development public health is also need that much only . He directed the public to discourage the opposition and explain it to them. The State Investment Promotion Committee (SIPC) has held a review meeting on industrial approval at his office in Secretariat. Earlier, the State Investment Promotion Committee (SIPC) meeting was held to discuss the possibility of permissions for four companies. The SIPC has emerged as the green light for the establishment of St Gobain India Pvt Ltd and Grob Machine Tools industry. Dinesh Kumar directed the Philips Carbon Black Limited Company to discuss the allocation of the land allocated by the respective landholders to the Arya refinery. The SIPC decided to approve the second phase of the cell-concrete industry in Tirupati. The land should be allocated to the extent of the requirement of the owners and not what they want. The prices of the land should be determined according to government regulations. In addition to the creation of industries, the government will have to revenue. At the same time there is no harm to the environment. 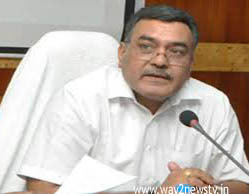 To remove people's misgivings about industry ...Chief Secretary Siddhartha Jain, state industries secretary, said, "Approval of applications for timely establishment of industries in Singh's desk portal as part of the industrial policy. He explained to CS Dinesh Kumar through Power Point Presentation on Approval of Approval from the new Industrial Policy in the State. He said 91.43 per cent in 2015-16, 96.89 per cent in 2016-16, 98.75 per cent in 17-18 per cent and in the year 2018 to 99.91 per cent. 40 applications have been rejected for various reasons. Says Dinesh Kumar, "There is a negative attitude towards the industry. The state is developing economically because of the formation of industries. It is possible to create jobs. The government should inform the public about the importance of establishing non-polluting industries. To eliminate the misunderstandings of the industry towards industries and to make them aware of the benefits of industrial growth. The health and safety of the people is very important for the government. During this review meeting, several chief secretaries Nirab Kumar Prasad, Salman Arjun Raj, A.Babu and others participated.